You may have been surprised to find out recently that e-book readers are still a thing, but perhaps even more shockingly, Barnes & Noble is looking to make a comeback in the tablet market. The world’s largest retail bookseller used to provide some stiff competition for Amazon’s Kindles a while ago, although unlike Fire slates, the Nook brand never caught on in its efforts to branch out. This doesn’t seem to be co-manufactured by Samsung, and even though it’s primarily aimed at digital reading addicts, it can do a great deal more than that. Apart from B&N’s impressive library of e-books, the 10-incher comes with full Google Play access, which might make it significantly more appealing to the masses than Amazon’s Fire HD 10. The Nook 10.1 is also slightly cheaper, at $129.99, while sporting an equally respectable IPS display with 1920 x 1200 resolution. Like the entry-level Fire HD 10 configuration, B&N’s affordable new 10.1-inch tablet can accommodate 32 gigs of data internally, as well as up to 256GB microSD cards. The battery life doesn’t sound bad either, at “up to” 8.5 hours of “reading, watching videos and web browsing”, aka normal use, while the 2MP front and 2MP rear-facing cameras are certainly not great, but at least they’re there. On the outside, the Android slate looks... about as generic as you expect at that price point, but intriguingly enough, you get pogo pins for easy Nook keyboard and Nook charging dock connections. Oh, and a headphone jack too. 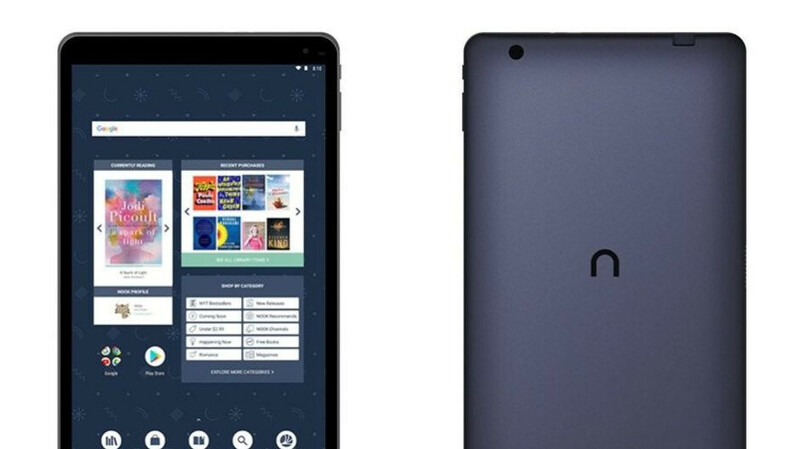 Up for online pre-orders starting today, the Nook 10.1 will be released on November 14 and discounted between November 22 and December 26 to $119.99. That’s quite an unusual strategy, but perhaps it’s better to be upfront about these types of things.